How to quilt a finished quilt? Once I finish a project it sits on my design wall while I think about how I am going to quilt it. Unfurling is no different. I am lucky enough to have two large walls that I can display quilts on. One is a wall the I look at everyday while I am working so it is the perfect place to have something on view. I took a picture of this quilt finished and then printed it up in grey tones so that I could doodle on the pattern to see what kind of quilting suited the project. So while I was sewing or ironing or even watching TV I would often dooble on these sheets. Finally I decided on how I wanted to quilt it. I knew that I wanted to make large feather designs in the center panel of this quilt and I wanted them all to be marked so that they would be exactly the same. 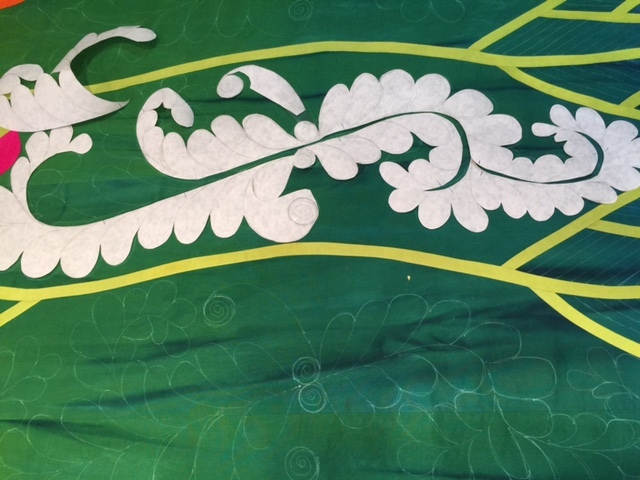 In order to do that I took a large piece of paper and traced around the shape the feathers would fill in the quilt. Then I worked with my compass and pencils to make the large feather shapes. Once I had the shape the exact way that I wanted it, I took a piece of freezer paper and traced out the design. I couldn’t decide how to transfer the design, which method to use, so finally I cut out the shapes and using my favorite Clover white marking pen I traced around the outside shape. After I had the outside shape lifted off each section and filled in each feather by hand. I also marked my straight lines using a ruler and the Clover pen. This pen will erase when you heat it so it is one of my favorite marking tools. I used Magnifico by Superior to quilt these large feathers. It is a 40wt polyester SHINY thread that I like very much. I also used it to stitch in the ditch around all of the design elements on this quilt, the leaves, stems, branches and trunks of the trees. I used silk to stitch in the ditch around the outside edge of the center unit and all of the hearts in the border with my even feed foot on my BERNINA 770 QE. 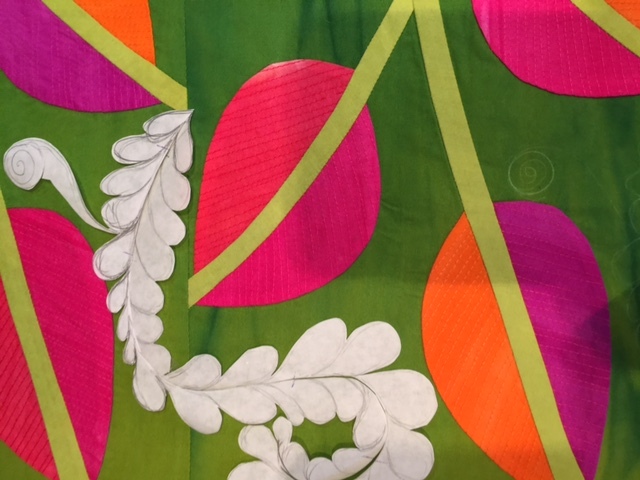 Notice the stitching in the leaves. I used Aurifil cotton thread in matching thread colors to do straight stitching on all the fabrics for the leaves BEFORE I pieced them into the background areas. I think it added a little something extra to the project. I went back in after stitching all the feathers and used Kimono Silk thread by Superior to stitch the stippling using my #24 free motion machine quilting foot. I also used Kimono Silk for the feathers and the straight lines in the border area. Once I had all the stitching done on the quilt I blocked it. I think so many people don’t bother with this process on their quilts. I laid it out on the carpet in my sewing studio on top of a white sheet and spritzed it with warm water. Then I stretched it and squared it up and using straight pins I pinned directly into the carpet. It dried over night and I gave it a good press and then squared it up. WhaaLa quilt ready for the sleeve and the binding. This quilt is dear to my heart. I love the trees and I love how it turned out and of course I love that it won a first place ribbon. But mostly I love that I made it.